It’s that time of year to reflect back on what the Natural Areas Training Academy (NATA) has achieved in 2018. It’s been quite a busy year! NATA offered 6 workshops (3 core workshops and 3 fire trainings) that were attended by 144 participants. 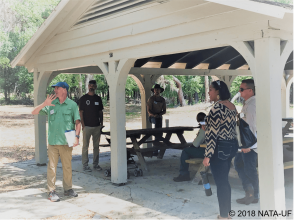 These participants represented 54 different organizations, including various parks within the Florida Park Service system, the Florida Fish and Wildlife Conservation Commission, water management districts, federal agencies such as the U.S. Fish and Wildlife Service and U.S. Forest Service, county agencies, non-profit organizations such as The Nature Conservancy and the North Florida Land Trust, municipal agencies, the University of Florida, Camp Blanding Joint Training Center, and private entities. Managing Visitors and Volunteers instructor Taylor Stein (UF) discusses recreation opportunities at Gold Head Branch State Park. Overall, this equates to 3,368 instructor-student contact hours! To make this possible, NATA had 34 instructors donate their time and share their expertise this past year. 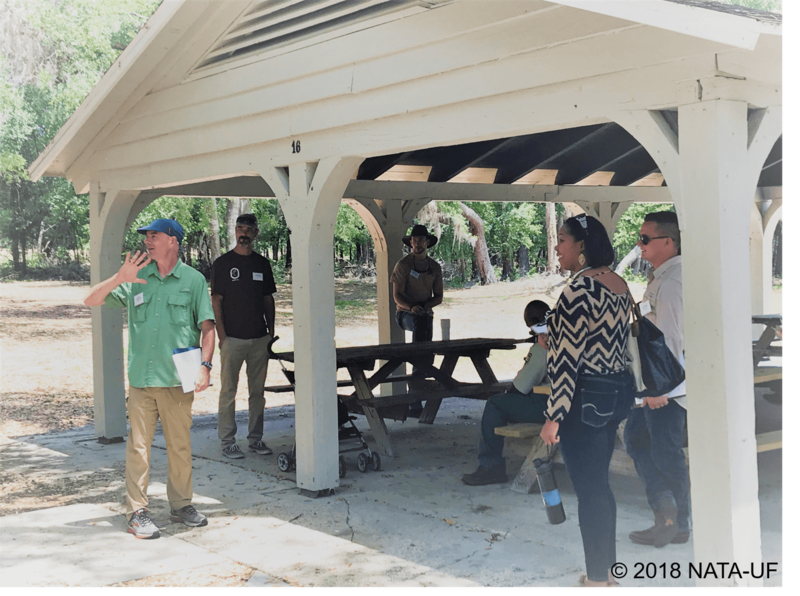 Instructors represented the University of Florida, St. Johns River Water Management District, Florida Park Service, The Nature Conservancy, Wildland Restoration International, and more. We are very indebted to our instructors, especially those returning to help fulfill our mission year after year! To read more from our annual report, visit our website here. We are pleased to announce we have a new and improved website that more clearly explains the process of how to earn a Certificate in Natural Areas Management. Moreover, the new website features an updated calendar of workshops we plan to offer in 2019. Those interested in taking a NATA workshop can navigate to the calendar section from our main menu to see when it’s offered, and read more about each individual workshop to get a better idea of what they can expect to learn by taking it. We hope the NATA audience finds this new website helpful and easy to navigate! Visit the updated calendar here. S130/190 workshop participant uses a drip torch at Ordway-Swisher Biological Station. In an effort to determine how many of our participants actually use what they learn after attending a workshop, we sent a questionnaire to all participants who attended S130/190 trainings between 2009 and 2017, and received some rewarding input. The majority of folks who responded (46 out of 56 total respondents) reported they had indeed managed prescribed fires and/or helped suppress wildlife since completing S130/190. Moreover, respondents revealed they have been collectively involved in 784 prescribed fires covering approximately 148,482 acres, as well as have helped suppress 126 wildfires since taking S130/190. This input from our participants confirms that S130/190 is fulfilling its goal of equipping participants with the skills and knowledge required to participate on the firelines. Now more than ever, we understand the value of the work performed by wildland firefighters as they battle devastating wildfires across this country. NATA plans to offer all four of our core workshops next year, in addition to 3-4 fire trainings. We will announce specific dates for each workshop via our listserv starting in January 2019. Not on our listserv? Join here. The Natural Areas Training Academy (NATA) provides skill-building workshops for natural resource professionals on sustainable management of natural areas in Florida.